On a warm sunny spring day following a rain, you may see swarms of termites inside your home. Termites are a year-round problem and may go undetected without careful annual inspections. The presence of swarming termites indeed indicates an infestation. 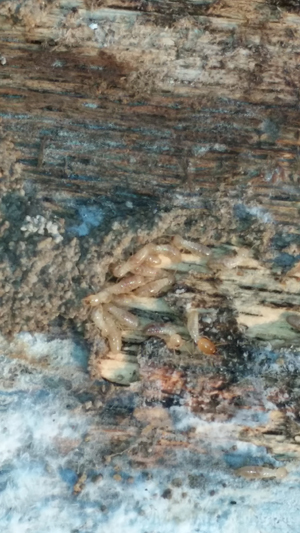 These flying, winged termites are on the move to start new colonies and destroy wood. When you see swarming termites, close off the room where the termites are swarming and carefully collect several examples of the insects to show your pest management professional. Termites are sometimes confused with winged forms of ants, which also leave their underground nests in large numbers to establish new colonies and swarm in a manner similar to the reproductive stages of termites. However, ants and termites can be distinguished by checking their antennae, wings, and waist. The termites will try to exit your home by following light. After their flight, the swarming termites will drop their wings and can no longer fly. At this point, they will mate and locate new sites (damp wood touching the soil, for example) to begin colonies. If you miss the swarm itself, you may find their rice-shaped wings on windowsills or near a heat or light source. To control termites, it is important to understand their habits. Termites are social, forming large nests or colonies. Each termite has a specialized job. The queen's role is to lay eggs, sometimes thousands in a single day with the king by her side. Soldiers with their powerful jaws and bulblike head protect the nests. The numerous male and female workers tend the queen, build the nest, and gather food. Queens and kings can live for decades while individual workers can survive for several years. An infestation begins when a mated pair finds a suitable nesting site in or near wood and constructs a small chamber, which they enter and seal. Soon afterward, the female begins egg laying, and both the king and queen feed the young nymphs on predigested food until they are able to feed themselves. Termites have microscopic, one-celled animals called protozoa within their intestines that convert wood (cellulose) into food for the colony. Once workers and nymphs are produced, the king and queen are fed by the workers and cease feeding on wood. Both nymphs and workers groom and feed one another and other colony members. Foundation vents and a vapor/moisture barrier may be recommended as a control measure. We recommend Sentricon®. Numerous stations are installed in the soil around your home's foundation. How is new construction pre-treated to control for termites? What are termites? They are highly social insects. These insects may live by the millions on one acre of property. When you build a structure on that property, you are providing a readily available meal for them because termites eat anything containing cellulose or wood fibers. Termites enter a structure through cracks in the slab and foundation and search for food – your home's wood frame. They chew the wood and microorganisms within their stomach process the food. Pest management companies keep termites away from wood by initial chemical applications and scheduled follow-up annual inspections. At what point during its construction should a new house be “pre-treated?” That depends on the type of foundation. Most homes in our region are built on either conventional foundations (block and pier) or have basements. While you see the occasional solid concrete slab foundation, it is usually found on commercial projects. Conventional foundations are treated with a liquid barrier under footers, inside block walls, under attached porches, and around the foundation after the final back-fill has been made. Basement treatments normally include treatment to the fill area or floor just prior to the concrete pour. Another treatment is then made once the house is finished and the back-fill is completed. The liquid barriers should be applied before concrete is poured and before any plastic barriers are used. Also the weather should be clear and dry during and following the treatment. Treatments should not be made in the rain or if rain is expected within four to five hours. The liquid chemical barrier needs to have a good contact with the soil and foundation. Another option is the installation of a bait system around the structure once it is finished. We recommend Sentricon® for termite control. The third option is treating the exposed wood with a Borate product. Commercial buildings should be treated even if they are primarily constructed from concrete and steel. These buildings have sheet rock and wood trim that must be protected from termites. All outbuildings like storage buildings and pool houses that contain wood building products also need treatment. As a builder, you should understand the pre-treatment process so you can be sure your construction project gets the most effective initial treatment possible. Several key issues contribute to achieving the best results. First, construction techniques and products used on housing structures can contribute to a termite infestation. Poor grading of the lot causes a moisture situation, making the area conducive to termites or resulting in rot damage that attracts termites and other wood destroying organisms including beetles and fungus. Moist wood is easier for termites and all wood destroying organ sims to eat. Wood siding or wood supports in direct contact with the soil attract termites. The use of pressure treated lumber can minimize or prolong attacks from termites but pressure treated lumber is no guarantee against termites. Termites can build their mud tubes through cracks in pressure treated wood or even around the wood. Even metal shields sitting on top of block foundations do not slow down termites; they just build their mud shelter tubes around the shields. Why is it important to pre-treat for termites? Just because new homes are treated for the prevention of subterranean termites while under construction, does not mean that it is the only time a treatment is necessary. A garage, outbuilding, or new addition should be pretreated. Most lending institutions require the pre-treatment of a new structure when a construction loan or a HUD-backed loan is involved. Even commercial buildings made of concrete and steel need a pre-treatment. Why? Because they contain sheetrock, wooden doors, wood stud walls, or other wood materials attractive to termites. Treating the soil to repel termites is commonly referred to as the “pre-treat.” The purpose of pre-construction treatment is to create a barrier between the ground where termites live and the structure being built. In nature, termites are actually beneficial insects because they consume old decaying wood and clear land of such materials. Unfortunately, they make no distinction in your home or office's wood construction material from wood decaying in the forest. Your new structure is encountered on their continual search for food. Termites live by the millions on one acre of property. When you build a structure on that property, you are providing a readily available meal because termites eat anything containing cellulose or wood fibers. They enter a structure through cracks in the slab and foundation and search for food – your wood frame. They chew the wood and microorganisms within their stomach process the food. But is it necessary that a new home be treated for termites? The answer is “yes.” A home is one of the most important investments individuals make in life. No one wants to see their largest investment damaged by termites. More importantly, termites do not differentiate between old and new houses. Should a new home be inspected every year? Again the answer is "yes." Termites don't realize a home is new or not. Also construction practices (including moving soil), water leaks from plumbing, roofs, or gutters, mulch around foundations, flower beds made from landscape timbers. Pest management companies prevent termites from invading your home by initial chemical applications, perimeter monitoring system and yearly scheduled follow-up inspections. It is hard to imagine that such tiny insects can cause such severe damage. Subterranean termites have survived for millions of years and have effectively adapted to their environment and construction practices and materials, ensuring their survival. If you live in the south long enough, you will experience some contact with termites. The further south you go, the bigger the threat. Tennessee and Georgia are both considered high pressure areas for termite activity as all states south of the M-D line. It makes sense to protect homes and other structures from termites beginning with the initial construction stage. Termites cause over $5 billion in damages each year to property. If a new home is not pre-treated during construction, post construction treatments are recommended. All outbuildings like storage sheds, garages, and pool houses that contain wood building products also need treatment. Construction techniques and products used on housing structures can contribute to a termite infestation. Poor grading of the lot can cause a moisture situation, making the area conducive to termites or resulting in rot damage that attracts termites and other wood destroying organisms like beetles and fungus. Synthetic stucco (EIFS) housing can also be conducive to termites if the material is not properly installed. This product should have a minimum ground clearance of 8” to 12” inches. The correct caulking material should be properly applied to windows and doors to minimize moisture. Many pest management companies refuse to treat structures with synthetic stucco construction. It is important to ensure that no wood debris or cellulose materials are left in the construction areas. When debris from any construction is left under homes, it attracts termites. Also be sure your pest management company performs the backfill treatment, a second termiticide application made once dirt fill has been placed against new walls. Insist your pest management company post the proper signage to verify that treatment has occurred – for the benefit of the builder, the homebuyer, and inspectors. Homes financed by FHA and VA loans are provided with a one-year termite-free guarantee. When purchasing a new home, the pest management company should provide supporting closing documents -- a “Subterranean Termite Treatment Builder’s Certification Guarantee,” a "New Construction Soil Treatment Record," and a contract. In addition, information about the pest management company is typically provided for the buyer. The new homeowner should continue yearly inspection of the home for termite activity. All pest management companies in Tennessee and Georgia are required to be licensed and insured. Tennessee also requires a bond. The license holder and technicians are required to attend training seminars and must complete on-going certification review classes in termite and pest management service categories. Nevertheless, it is a good idea to ask for credentials when anyone performs pre-treatment services for you and confirm all tanks, chemicals, and service vehicles are labeled and employees have proper identification. What steps can I take to protect my home from termites? Your home may be hosting unwelcome termites without you knowing it. Typically termites swarm from your home in the warm days of spring and early summer. You are typically only aware of a termite infestation when you see the swarms from the active colonies. There are tips you can take to both safeguard your home from infestations of termites. These include keeping mulch and wood or cellulose bedding materials at least one foot from the foundation of your home. Also use brick or stone as borders and not timbers or other wood - even if it is pressure treated wood. Remove all scraps of wood and wooden debris from around your home, particularly in the crawl space. Wood debris is equivalent to a flashing green light to attract termites. Move sprinklers and set sprinkler systems so they do not spray water near the foundation of your house. Remember moist wood is easier for termites to eat. Also keep your gutters clean of plant materials and make sure the downspouts direct water at least three feet from your home's foundation. Check your home periodically for signs that indicate termites are present. These can include piles of discarded termite wings on windowsills, floors, or tops of furniture or counters. Inspect for small piles of wood shavings or residue as well as any small holes, sagging doors, or crumbling drywall. Pencil-sized mud tubes running across concrete or connecting soil to wood are indications of termites as is bubbled paint. Even though you watch for these unwanted termites, industry practice recommends your home be inspected at least once per year by a pest management company. This is particularly important since your home is your largest investment. The inspection can be conducted at any time of the year. Termites are most active in the spring and summer months, but given the right weather conditions (warm, moist, enclosed environments with an available food supply) they remain active the entire year. New homes must also be inspected on an annual basis. Construction pre-treatment warranties are valid only for one year but most may be extended through a signed contract with the company providing the original treatment for your builder. Your yearly review should include a visual inspection of the wood framing, crawl space, basement, interior walls, exterior perimeter, and outbuildings. If active termites are found, treatment options include a chemical application using an EPA-approved termiticide such as Altriset™ or installation of Sentricon® around your home. In the first option, a termiticide (chemical) is applied around the foundation, under all attached porches and garages and to the exterior perimeter of your home. The barrier surrounds your home, killing active termites and protecting from further invasion. In contrast, Sentricon® is installed around the perimeter of your home. Round stations are installed in the ground typically 8-10 feet apart and 2-3 feet from your home's foundation depending on your landscaping. The termites find the station and feed on the bait inside. The stations are inspected periodically. Sentricon® offers total colony elimination. The chemistry of termite products today provides a more effective method of control because the products are not repelling termites as they did in the past, but expose termites via a transfer effect. Termites are not aware of the presence of the product. These highly social insects pick up the chemical and ingest the product as they groom themselves and expose other termites when they return to their colony. Be sure you contact a licensed, bonded, and insured pest management professional with trained technicians certified to work in your state to perform all your termite and pest control services. Ask to see the company's license and proof of membership in local pest control associations or the National Pest Management Association. My neighbors had swarming termites and had their home treated for termites. We have the stations and I am concerned about their effectiveness as compared to the liquid treatment my friend had. What are your thoughts? 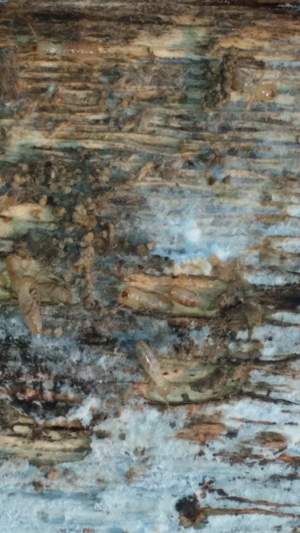 Termites emerge as winged pairs budding off to form new colonies. Their presence does signal an infestation that must be treated. There are two ways to control termites. One is using the liquid treatment like your friend had. This can involve drilling into the foundation and attached slabs of the home and injecting a liquid termiticide. In addition, a small trench is dug around the perimeter of the home and treated with an unbroken line of the liquid termiticide. The termiticide kills termites when they pass through or come in contact with the product. The chemical has a "residual" and this barrier protects the home from further termite invasions if left undisturbed. A second way to control termites is to use a non-repellant chemical that prevents termites from growing. This chemical is applied in a bait matrix (bait and an attractive cellulose food) inside in-ground stations around your home's exterior. Insects wear their skeletons on the outside of their bodies. This material is made of chitin. The chemicals used in the stations around your home are chitin synthesis inhibitors. Termite workers and soldier cast members come in contact or consume with this chemical but it does not kill them immediately. It is slow acting so as not to alarm the termites. Termites transfer this chemical to their colony members through feeding and grooming, thus destroying the termites' ability to molt or grow and resulting in their death. Stations are plastic tubes with a large head on top and the tube is approximately 12" long. They are installed at prescribed ten-feet (minimum) intervals around the entire external perimeter of your home usually about 2 to 3 feet from the foundation and away from the drip line of your roof and gutters, depending on your landscaping. The plastic station contains a cellulose product. 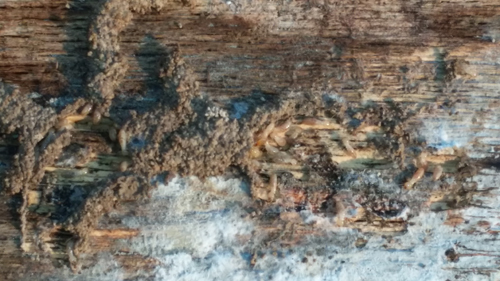 This may be a pine wood stick, saw dust, or other cellulose materials that termites like to eat. Sentricon® contains Recruit® HD termite bait. Your pest management professional inspects each station periodically to look for presence of termite activity. With special tools and scanning equipment, the station is opened and inspected. The bait is effective and reliable and will eliminate termite colonies. Compared to a liquid treatment, the stations are a more environmentally sensible choice. There is a low risk of environmental consequences including spills, leaks, or contamination that could be present with a liquid chemical. There is no drilling in floors, foundations, or trenching around buildings as the stations are on the exterior of your home. A simple hand auger or a gas-powered drill is used to install stations into the ground and technicians take care to avoid plumbing, electrical, and utility lines as well as landscaping. The top of the station is usually at or just below the ground level and they do not interfere with mowing. The chemical bait is only used in the stations, whereas the liquid treatment is often applied throughout the entire home and even inside. Since human bodies are covered with skin and not the hard chitin exterior of insects, the chemical in the bait stations are not harmful to us. The stations have been on the market and thoroughly tested by the manufacturers since 1995. Research has developed the preferred textured cellulose products that are most palatable to termites and studies have found the foraging termites prefer it to plywood, soft yellow pine, dry wall, oak flooring, and particle board or Oriented Strand Board (OSB). The cellulose in the stations absorbs moisture and spaces in the material are an attractive habitat to termites. The stations intercept the movement of termites toward your home.The bait in the Sentricon® System is Always Active™. The technology is used to destroy termites by stopping their ability to molt and thus offering colony elimination. As to which approach is better, it is often a matter of preference. The stations are approved for both new construction and for existing homes and businesses. They can be installed by deck posts, near wood mailbox posts, and around other wood structures on your property. Your technician will number the stations and prepare a graph of their location. Enviroguard uses a handheld device and bar coding to assess each station as well as the Always ActiveTM Recruit HDTM bait inside. With a periodic service, your home is screened for termites more often than the typically yearly-inspection recommended for homes having a chemical termite treatment. That being said, some homes using stations may also need a "spot" or small area treatment with a liquid termiticide if termites bypass the stations and enter the house. Because termites are blind and are just foraging for attractive cellulose products, they may miss the stations and find your home instead. Last year I had swarming termites and my pest control company used a liquid to treat my home. Do I need to have my home inspected this year? The presence of termite swarmers indicated you had termite colonies living in your home. In fact, when the winged, reproductive swarmers emerge in the spring, it is an indication the colony inside your home was large enough that more termites, were emerging to establish new termite colonies. The foundation of your home was probably drilled and a liquid termiticide injected into these holes to create a barrier under concrete foundations to eliminate the termites. Homes with basements and crawl spaces are treated within and around support piers and inside wall voids. In addition, the standard treatment is to dig a six inch trench around your home’s perimeter and inject this trench with additional termiticide and then replace the dirt in the trench. This creates an unbroken barrier around your home to prevent new termites from entering. Termites are always present in our environment and they live in the ground. Simply eliminating those termites in your home at one point in time will not necessarily prevent new termites from moving through the soil to establish new colonies in your home. If the chemical application did not reach all the termites locations, they could still be inside your home, continuing to eat structural wood used in construction and other cellulose material. Termite chemicals degrade over time due to age, heat, sunlight, and other environmental factors. Also the chemical barrier within the trench around your home may be disturbed and broken due to landscaping, mowing, activities of small mammals and pets, and rain and wind. Cracks often form in your home’s exterior due to shifting and settling of the foundation, particularly in new homes built on lots that have been filled or graded. Termites move within the soil between cracks in concrete and over the foundation's footings to find the wood in your home. It is critical to have a yearly home inspection in our area. An annual inspection of your home will ensure you are termite-free. Skipping the yearly inspection could result in hidden termites continuing to eat undisturbed, causing costly structural damage. Repair costs will far exceed the cost of your inspection and peace of mind. The latest trend in the industry, in addition to the yearly inspection of your home and its foundation, is to also install a termite baiting system around your home’s exterior perimeter. Termites eat the bait in the wood inside each station and transfer the bait to other termites when they return to their colony. The termites distribute this bait through grooming. 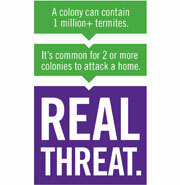 The colony may be located inside your home or it may be somewhere in your yard or your neighbor’s yard. Unlike the liquid chemical used in your initial treatment, the material used in a bait system does not work immediately. This bait works by preventing the growth of the termite’s exoskeleton, which kills the termites as they try to grow larger through molting. By checking the stations periodically, you pest management professional can detect termite activity. By noting which stations contain termite activity, your technician has clues as to the location of the colony as well as the size of the colony. If termite activity is significant, your home may be treated with liquid chemicals in addition to the baits used within the stations. With this comprehensive approach, you can be assured of the protection of your home from these wood-destroying organisms. Finally, a yearly inspection is recommended to detect conditions that could lead to termite infestations, including poor drainage, cracks or holes in your home’s foundation, rotting wood, and any structural wood in close contact to the ground. Because termites are not the only insects that eat structural wood, your pest management professional will also check for other wood-destroying organisms including carpenter ants, carpenter bees, old house borers, wharf borers, and other species of wood-destroying beetles and wood-decay fungus. Click here to learn more about Sentricon®. We had swarming termites at our home this spring. How long had these termites been eating our home? Male and female termite reproductives swarm and leave their old colony to establish a new one. When you see swarming, winged termites, they are from a mature, established colony that has developed over a number of years. Typically colonies of subterranean termites begin to swarm when the colony is approximately five years old. The number of swarmers provides key information to the age and size of the colony in your home. Have a pest management professional make a thorough inspection of your home. It may be necessary to drill your home’s foundation and inject or foam a liquid termiticide in the foundation and wall voids. In addition, a trench should be dug around your foundation and a continuous barrier treatment applied. Installing exterior perimeter termite stations will prevent new termite entry. First, the termite damage will be on anything made of or containing cellulose or wood fibers. While termites may tunnel through sheet rock or damage foam board insulation, they are actually searching for wood to eat. They prefer softwoods like pine and fir but can damage any wood. Termites feed along the grain of the wood, so you'll see damage to the wood following the direction of the wood grain. They prefer to eat the softer spring growth wood layers so the damage will appear as lines of eaten wood filled with mud and separated by a hard ring of wood above and below. The damage continues throughout the wood and will resemble a honeycomb effect. The mud in the eaten areas was brought in by the termites to keep the wood moist and make it easier for them to destroy and digest. The termite damage you see is done by the worker caste. If you have an old, decaying tree stump in your yard, you may be able to easily see termite activity. In this case, their damage is really helping to eliminate the rotting stump and convert it into basic elements for use by other organisms. During renovations on the outside of my home the contractor found damaged wood caused by termites when the siding was removed. Live termites were seen in the damaged wood so I called my pest control company. When the inspector arrived to examine the damage he could not find any termites. He said that termites will leave the area if they are disturbed, is this true? The termites may be gone from the damaged wood but they have not left the area. When the siding was removed termites were exposed to sunlight. 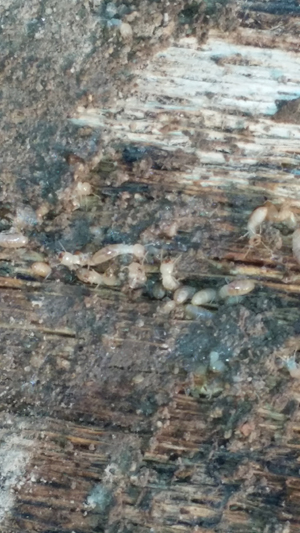 Worker termites will quickly leave the work-site when disruption occurs. Out of concern for their safety from attack of natural predators like ants and exposure to sunlight, which will kill termites. They may return to the site. When termites infest a house, the house becomes part of the termite colony and other parts of the house are probably infested or will be soon. It is essential the entire house be re-inspected to determine if other areas are infested and that the newly found damaged areas be closely inspected. As I drove into my garage, I noticed several spots on the wood trim. My first thought was the paint had come off, but when I touched it, the wood crumbled and my fingers went into the wood. I found more soft spots where the wood just crumbled. Could this be from termites or moisture (My home was treated last year for termites)? An inspection by a pest management professional (PMP) would determine is the damage is from termites or moisture. Since your home was treated last year, call the pest control company and ask an inspector to look at this. Termite damage can be determined by the presence of galleries found in wood that have the appearance of grooves cut along the softer grain of the wood between the harder layers. These grooves or galleries may contain mud tubing from previous termite activity or you may even see live termites. An active termite infestation might exist because this part of your home was not adequately treated. We often find termites in the trim around garage doors and in the sheetrock or block walls inside garages. The garage is typically protected from the weather and this provides shelter for termites to work uninterrupted year round. In addition, homes are often constructed in phases. The home's main living area is typically built on a foundation over a crawl space or basement. Once this is completed, builders fill in and pour the concrete slab for the garage directly adjacent to the foundation. Lastly, the driveway is poured against the garage slab. Each concrete section has a joint cut into the concrete to allow for natural expansion and contraction with changing weather and temperature. Cracks form in these expansion joints, by design. These cracks allow easy entry points for termites to travel from the ground where they live to the wood in your home. Termites form their mud tubes and travel up the walls, eating the wood trim and studs. Because some tubes are hidden behind the wall, your first indication of their presence is the spots on the wood trim or holes in sheetrock. In many cases, termite damage is mistaken for peeling or bubbling paint. When you chip away the paint or press on the wood, it may feel spongy. The termites have eaten woody layers and instead of a solid piece of wood, your wood looks like corrugated cardboard (honeycombs). An inspection under your home, around the foundation, and inside your garage can reveal the presence of mud tubes. These shelter tubes allow termites to work undisturbed while maintaining the constant humidity their bodies require. If, on the other hand you have moisture damage, you may only notice spongy wood without the presence of eaten galleries. The moist wood would be more splintery or be broken into cubical sections (called cubical rot). Moist wood is a problem and must be corrected because moist wood is easier for termites and other wood-destroying organisms to infest (including carpenter ants and wood boring beetles) and is often a precursor for future damage. Most companies use a moisture meter to determine the amount of moisture in the wood. Wood typically contains around ten percent moisture and when a reading indicates twenty percent or higher, decay will follow. I recently found small holes in the wood siding on my house. Could termites do this? Termites do not make exit holes in wood. Instead, they consume the wood from within. They travel from their underground nests to the wood inside your home through mud tunnels they construct. There are a number of wood infesting beetles. Their larvae damage the wood and when they develop into the adult stage, they make exit holes in wood. 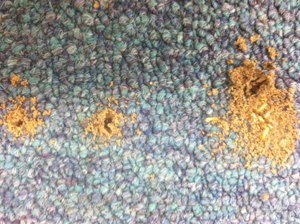 Your pest management professional can determine if these holes have been made by a wood boring beetle and if infestations exists. They will also determine appropriate treatment measures to control these damaging beetles. Do I have termites in my motor home? Recently I was contacted by an individual who thought termites or another insect was damaging the walls in her motor home. She found holes on the shower walls and offered to drive the motor home to the office. It is common to find ants, mice, and even termites in mobile homes, campers, and boats. Our pest management professionals inspected her motor home and found no pests, but determined the holes in the shower walls were caused by staples used to install the water-proof wall. Over time, the water-proof panels worked loose from the staples allowing water behind the walls. This condition, however, can lead to mold and rot which weakens the wood, making it vulnerable to wood-destroying insects. Motor homes left for extended periods can be hosts to a variety of insect pests and mammals. A mortgage lender told me that HUD no longer requires a termite inspection. Since termites are such a problem in our area can this be true? No. The Department of Housing and Urban Development or HUD has never stopped requiring inspections in our area of the country where termite inspections are the norm – and Chattanooga and Hamilton County would certainly be in the norm. To determine areas with the greatest amount of termite pressure or activity, HUD uses the U.S. Forest Service Maps to make that determination and this has probably led to some field offices and lenders confusion. Even though HUD only guarantees less than five percent of housing loans, conventional lenders will typically follow the lead of HUD. My house was treated for termites last year. The company who did the treatment has called to schedule an inspection this year. I have not seen any termites. Is it really necessary to have my home re-inspected annually? Yes. Even if you have not seen termites since your home was treated last year, this does not mean the termites are completely gone. Termites have been on earth for over 250 million years and have adapted to all barriers and could eventually find their way back into your home. In the southeastern part of the United States, termites are quite formidable and should not be taken lightly. They can and do cause serious damage to homes and businesses. It is estimated that termites cause over $5 billion in annual damage to homes alone. There are multiple reasons for you to have your home inspected each year even after it has been treated. First, an annual inspection by a licensed professional can insure that the termite infestation has been eliminated and no new infestations have occurred. Your pest management company can inspect crawl spaces and key areas where termites could be. If termites are found, additional treatments can be applied. Your initial treatment came with a guarantee which can usually be extended by a contract for service. As part of the terms and conditions of the contract an annual inspection and re-treatment is provided. Finally, treatments do not last forever. I am often asked how long a termite treatment will last. In short no one knows for sure, because so many factors come into play including environmental factors (like excessive moisture), soil conditions, construction methods, and the amount and types of chemicals used. The best protection for your home is to maintain your termite contract with your pest control company. Homeowner’s insurance will not pay for damage caused by termites. Consider the annual inspection fee as an insurance premium designed to protect your home from termites. Homeowners think because they have not seen swarming termites there is no threat and therefore do not need additional or annual inspections. As household budgets become strained, the temptation might be to drop the annual termite inspection to save money. But, like fire alarms, smoke detectors, security systems, and other forms of insurance, termite contracts are necessary. Often when a customer stops their annual inspection and wants to resume the service later, the pest control company may require you to pay for another termite treatment or bait system installation (which costs much more than the annual inspection fee). Dropping a termite contract can hinder an owner’s ability to sell their home because potential buyers will think twice, if other homes they are considering have been continuously under warranty by a termite contract. If you are a homeowner, have your home inspected and treated by a licensed company and maintain the annual inspection and contract. You will be glad you did. When I bought my house I received a termite letter that did not show evidence of termites. Now I believe there could be a problem with termites at my home. How long is this report in effect? In Tennessee and Georgia the findings are warranted for 90 days from the date of inspection listed on the report. There are exceptions (active termites, old damage, concealed damage, or conducive conditions) to this time frame and if a problem exists, contact the pest control company issuing the report. It is important for homeowners and the general public to know some important facts about a “termite letter”. To call it a termite letter is a little misleading because the inspection includes more than just looking for termites. In Tennessee the report is actually called a “Wood Destroying Insect Inspection Report”. Those insects that destroy wood include termites, re-infesting wood boring beetles such as powder post beetles,carpenter ants, and carpenter bees. The Georgia report is called a “Wood Infestation Inspection Report”. This report covers termites, beetles, wood decay fungus, dry wood termites and all conditions that may be conducive to an infestation. The actual inspection of the property is just a snapshot of what was found through a visual inspection at a particular time and date. Termites are always present in our environment and could be in your home and may not be detected, remaining hidden in an inaccessible area. We have been in our home six months. The house was built in 2013 and our real estate closing documents showed no termites were found during the inspection. Can we feel safe with this “clean” report? This report means that a careful professional inspection of the accessible, unobstructed areas found no visible evidence of termites and other wood-destroying organisms on the inspection date. Every home has wood frames and supports that cannot be seen without dismantling or destructive probing. Other areas may be covered and inspection is not possible. These include floors (covered by carpet on wood), walls (covered by paneling or wall paper), exterior (covered by insulation, brick, or siding), and even furniture, appliances, or other stored material prohibits access for inspection (garage, closet or attic). Your inspection report will note these excluded, inaccessible areas. For this reason, it is important to have your home under contract with a licensed pest control company for a yearly inspection of your home. Enhanced protection would include the installation of a bait system to your home's foundation. Periodic inspection of the bait system combined with a thorough yearly inspection is preferred to protect your home from termites. What should I know about termite contracts? I'm a new homeowner. There are two main types of termite control service contracts. They typically state that the pest management company will either (1) treat a new or recurring infestation of termites or (2) treat a new or recurring infestation of termites and repair any new structural damage caused by termites. They are commonly referred to as a retreatment (control-only) contract and a repair contract. The repair contract can cost significantly more than the retreatment contract. The terms and control conditions vary by company so read and review the contract. Most are five-year annual renewable contracts. The initial treatment cost typically covers the contract for the first year. The annual renewal fee is normally due at the beginning of the second year. Contracts are also available for the inspection of termite baiting systems. The stations are inspected quarterly and contracts also include a thorough yearly inspection as well. What questions will the technician ask of me when I have a termite inspection? I’m a first time homeowner. Congratulations on your purchase and you are wise to protect it from wood-destroying organisms. To better inspect your home, your pest management professional will ask if you have seen termites or termite swarms (near your windows, perhaps). He will ask about any termite damage. If there was prior, old damage to you home, it will be noted on a graph with your real estate closing documents provided when you purchased your home.You will be asked how long you have owned your home and when it was built. If you have made any construction changes or foundation repairs, mention these along with any drainage problems or other sources of permanent water nearby. Mention too any moisture problems you may have noticed. You may be asked the location of plumbing and heating lines and whether your crawl space or basement is locked. Your technician will need access to these areas. 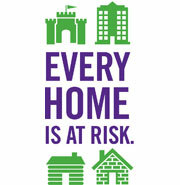 Also mention if you have pets, infants and small children, or elderly persons living in your home. How can I look for termites? One of the easiest ways to spot termites is to look for their mud tubes. They are often compared to the thickness or width of a pencil and you will see them on your home's foundation walls. These tubes are used by termites to bypass the non-wood parts of your home as they forage for wood to eat. During treatment for termites, your pest management professional will break and remove these tubes to limit the termite's access to your home. Termites construct mud shelter tubes for transportation and protection. Each termite has a thin, soft, body. The tubes protect them from the drying effects of wind, air, and sunlight and also from their key enemy, the ant. Visible termite shelter tubes are always an indication of termite activity, but their presence may not be from a current infestation. Old, abandoned exploratory tubes will be dry and brittle and will not contain live termites. Termites may be using another route, perhaps hidden, to their feeding site. My neighbor mentioned a boric acid treatment was performed on her new home? What was that for? Pest management professionals are using boric acid or borate to treat the wood nearest the ground to help prevent termites. It is extremely effective as a treatment option for homes as they are being built. The boric acid solution, often impregnated with a dye to aid in its proper application, will penetrate wood to protect it from termites. Other new construction treatment options include liquid termiticides and perimeter foundation termite bait system. Borate treatments are sometimes applied to the subflooring of an existing home with active termites. Enviroguard offers all three treatment options. I am building my house next to a lake. What are my treatment options to prevent termites? The use of most chemical treatments, in this situation can be extremely risky because traditional termiticides contain label advisory statements that prevent use near bodies of water. Some chemicals are toxic to fish, so extreme care must be taken to avoid runoff and to avoid any conditions where movement of the liquid treatment from the treated area is likely to occur. For example, if your home is less than 100 feet from the lake, or the landscaping or any side of your new home slopes toward the lake, your pre-construction treatment to prevent subterranean termites would not be with traditional liquid termite chemicals. In our area, the two most popular methods of protecting your home from termites near a lake are (1) to install a termite bait system around the perimeter of your home after construction and landscaping are completed or (2) to treat the wood framing with a borate-based insecticide/termiticide, like Bora-Care®, while the home is being constructed. Borates are effective and safe. Both methods are approved by the International Building Codes as suitable alternatives to soil treatments. How long is the liquid termite treatment supposed to last before it should be retreated? 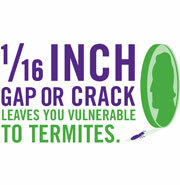 Modern termiticides are designed to control termites, on average, for five years, though this interval may vary. This is why a yearly inspection is recommended to follow up on the effectiveness of liquid treatments. Maintaining this ongoing termite service agreement with a pest control company is a good "insurance policy" to protect your home. For long-term protection, we recommend the Sentricon Colony. The pest control company found termites swarming in my bedroom. They gave me two treatment options -- either a spot treatment for the room which was much cheaper than the second option of treating my entire home and installing a bait system. What is the difference? 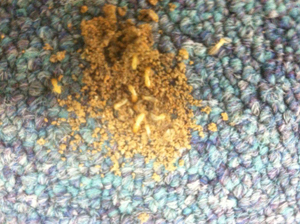 Swarming termites are an indication of active infestations. Termites alate swarm from their colony and establish a new colony. They move in mated pairs. The winged swarmers move toward the light, seeking an exit. After they swarm, they lose their wings. A sign of an active infestation is their wings, shed in a pile, on or near window ledges. The presence of termites within your room is indeed a cause for concern since their food source is the cellulose or wood material used in your home's construction. A spot treatment is a treatment with an EPA- approved termiticide to the indicated room, in this case, your bedroom. If termites are only found in this area, it is an effective treatment option. The risk, however, is termites have budded or split into several colonies elsewhere within your home. As termites multiply and spread, it is unlikely they are only in one area. Treating your entire home involves drilling equally spaced holes around your home's exterior, treating these holes with a liquid termiticide, and capping the drilled holes with a plug and cement. A trench is also dug around your home's perimeter and this dirt is treated with the termiticide and then the soil replaced. In this approach the chemical finds its way under your home's foundation and you have a continuous chemical barrier around your home to prevent the entry and establishment of future colonies. Typically, complete chemical treatments are guaranteed and you will have a warranty against future termite infestations. Your pest management company should inspect your home yearly and treat your home if conditions indicate termite activity. Another option to this option, a bait system could be installed around your home's perimeter to prevent termites' movement toward your home. 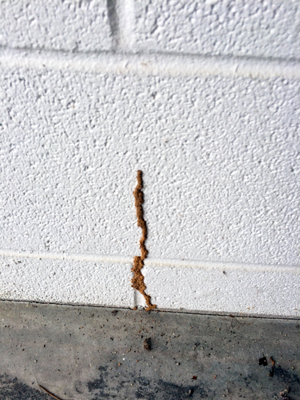 If your neighbor has had a recent termite treatment, it is logical for termites to move to another feeding site. Enviroguard recommends Sentricon®. The bait is an insect growth regulator (IGR) used to eliminate the termite colony. Periodic inspection of termite stations is recommended. A termite treatment with a bait system offers a formidable defense against termites. A friend mentioned she had to change from a wood-burning fireplace to gas logs to prevent termites. Why was that? The problem was not related to the fireplace itself, but with the exterior and interior storage of wood logs used as fuel within the fireplace. Wood piles are normally stored near the home to make it convenient to bring the wood inside for use in the fireplace. Some wood is even stored inside the home, near the fireplace hearth. The wood piles are attractive to a number of wood destroying insects including beetles and especially termites. You will remember the helpful role of termites is to consume fallen trees and dead wood and turn it into compost that can be reused in the forest. Termites naturally occur in the soil and take their role of removing or eating fallen trees (dead wood and cellulose material) very seriously. In forests and natural settings we appreciate the work of termites to clean the forest floor. However, near or in our homes, termites are particularly unwanted. Termites, unfortunately, cannot distinguish between the wood used in our home's construction or the wood pile we have neatly stacked by the door, from a fallen diseased tree in the forest. Your friend switched to gas logs for her fireplace to eliminate the risk of moving termites in the stored firewood from moving into her home. Another point that owners of new homes should also consider, because termites are only seeking wood material, they do not distinguish new wood in a new home from older wood in an older home. All are attractive food sources. For this reason, all homes and buildings require, at a minimum, an annual inspection for the presence of wood-destroying organisms. Termites and carpenter ants have similar skills and behaviors. As social insects both live in nests and are organized in castes of workers, soldiers, and queens. Once a year, queens and males leave their nests to mate and set up new nests, extending their territory. Workers and soldiers collect food, defend the nest and queen, and lead violent attacks against other insect species. Swarming termites and flying carpenter ants are often mistaken for each other, particularly in the spring and early summer when both have wings and have emerged in a swarm to mate and establish these new colonies. Swarmer termites resemble flying black ants instead of their normal white appearance. Both pests are destructive to wood. Termites eat wood and carpenter ants excavate wood for their nests. Both must be controlled. It is important to correctly identify the pest for the most effective treatment. Carpenter ants begin their nests in moist, decayed wood and voids (trees, rotting logs, and stumps) and later expand into solid, sound wood. While carpenter ants are important in the balance of nature because they burrow and nest in dead trees and speed the decay of dead wood, when a colony invades and damages the integrity of the wood within your home, they to must be controlled. Carpenter ants remove wood in the form of a coarse sawdust-like material, which they push from the nest and its galleries. This often results in a cone-shaped pile accumulating just below the nest entrance hole. This pile may include, in addition to the wood fragments, other debris from the nest, including bits of soil, dead ants, parts of insects and remnants of other food they consumed. You may even hear sounds produced as workers chew to remove wood to enlarge the nest. They enter buildings around door and window frames, eaves, along plumbing and utility lines, and over branches touching the structure. They forage at night feeding on plants, fruit juices, insects, food debris, meat, cakes, pet foods, and grease. If you identify the swarmer as a termite, you should call your pest management professional immediately to take action against this destructive pest. Usually you do not see any evidence of the termite destruction until their damage is extensive. Termites enter your home through cracks in the foundation and by other wood-to-soil contact. They work continuously eating your home's wood and other cellulose material. Termites "honeycomb" inside wood beams slowly and methodically, typically without breaking through the surface. As a result, their attacks often go undetected for years. Should you spot what you think may be termites, have them checked soon before their damage gets out of control. Consider the presence of swarmers as a warning sign. For carpenter ants, your pest control professional will locate and flush nests and may inject insecticide dust into wall voids. Perimeter treatments also may be applied along with spot treatments at entry points. Sprays are used around the base of trees that may harbor nests. Gel baits may be used on trails where carpenter ants enter and leave buildings. For termites, the treatment may include a perimeter pesticide application and baited stations. Are termites the only wood-destroying organisms? Termites are the most destructive wood-destroying organism in our area but there are other word-destroying organisms that often need attention. Surface molds or mildew fungi discolor the surface of wood. While they do not weaken wood, their appearance indicates your home has excess moisture or high humidity. At a moisture content of more than 20 percent, severe wood decay from fungi can occur. Wood-inhabiting fungi are small plants that lack chlorophyll and use the starch and proteins in wood as their primary food source. Fungi-infested wood is weakened and may appear either brown and crumbly or white and stringy. Brown and white rots also attack moist wood. Your pest management professional will use a moisture meter to assess your wood's moisture content and recommend improved ventilation and repair of leaks to prevent further growth of fungi. Wood-inhabiting insects can also harm your home's wood. 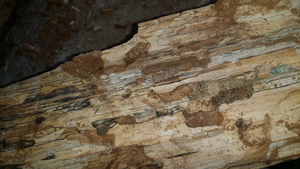 Many insects use this wood as food material including the larval stages of termites and wood-boring beetles. Other insects use your home's wood structures for shelter, like adult carpenter ants and carpenter bees. Termites are the most destructive pests of wood structures in the United States. Termites can be detected by the presence of swarming termites in the early spring, wood damage, and mud tubes or passageways for the termite workers between the soil and wood. Some insects reinfest structural wood and these include a number of beetles. Furniture beetles and deathwatch beetles are often found in basements, crawl spaces, barns, and other unheated structures with a high moisture content. They can remain active in lumber or logs for many years and usually do not destroy the wood unless there are fungi present. The furniture beetle prefers furniture, picture frames, subflooring, hardwood flooring, and interior trim wood. Lyctid beetles prefer hardwood and may be found in new constructions (oak flooring and mahogany trim). Often the wood is infested in a lumberyard. The damage is small circular holes in the surface of the wood and the presence of very fine sawdust under the holes. Painting and varnishing wood will seal the pores beetles use to lay their eggs and can prevent infestations.The larvae of old house borers and wharf borers also live in decaying wood. The oriental wood borer damages bamboo products and imported baskets. They also like paneling, packing crates, boxes, plywood, and furniture. With the continued growth of imported furniture, more beetle problems will occur. China currently imports lumber from Malaysia for their furniture manufacturing and much of this furniture is exported to the United States. This wood can have beetle infestations. Other insects primarily use wood for shelter. Ambrosia beetles attack wood and eat fungi they carry into the wood. Their damage results in small holes and blue-black stains (from the fungi) on the wood. Bark beetles feed on the inner bark of trees and are only a problem if they are brought inside on firewood. Chestnut lumber used in furniture and paneling and prized for its ornate appearance with small shot-holes, is the result of a weevil called the timberworm. Other pests of wood are the flat-headed wood borers, the round-headed borers, and the horntails. Carpenter ants and carpenter bees use structural wood in your home for their nesting sites. While neither eat the wood, they can cause extensive damage. Carpenter ants like structural hardwood that has become wet due to a water leak or poor drainage. Carpenter bees bore into wood ceilings, railings, trim, porch furniture, window sills, or wood doors to make their nests. The female lays her eggs in early spring and the newly formed adult bees emerge in late summer. The bees live in the nests during the winter and repeat the cycle of damage.